Homemade Crock-Pot Apple Butter is easy to make and allows control over the amount of added sugar. Or add no sugar at all. It’s a great gift idea too. My affection for apple butter kinda snuck up on me. I thought I was perfectly happy with strawberry jam and an occasional applesauce replacement for oil. I’d taste it every now and then. But, I didn’t really feel the need to keep it on my grocery list. Then, I used it to make Apple Cheesecake Parfaits…and it was divine. When I needed a “glue” to hold together Vegan Stuffing Muffins, it was fully up to the task and gave them a spectacular burst of flavor. It was only a matter of time before I began to ponder making a homemade batch of apple butter in a slow cooker that used less sugar. It turns out it’s easier than you might imagine. 1. Core, peel and slice 6 pounds of apples. It sounds like quite an ordeal. But, it’s really not that bad, particularly if you invest in an apple corer (mine was under $7.) And, 6 pounds makes LOTS of apple butter. Make a half batch if you’re not planning to share it as a gift or don’t want to stow some away some jars in your freezer. Use a sweet apple variety if you plan to cut back on the sugar. I used sweet honey crisp apples. A mixture of apple types is always a good idea. Other apples on the sweeter side include Ambrosia, gala, pink lady and golden delicious. Granny Smith apples are easy to find in the grocery store. They are tart!!! Use those for another recipe. 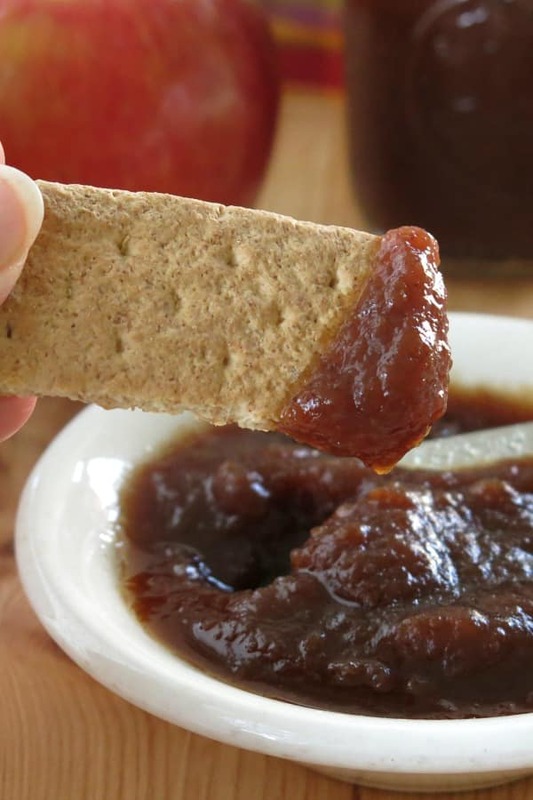 Do you have to use sugar to make Apple Butter? Nope. You don’t have to add any sugar at all. It’s a matter of taste. The amount of sugar added is up to you! I adapted this recipe from one over at My Baking Addiction. And, yes…the apple butter over there is divine. But, I found that I absolutely didn’t need all that sugar. I cut the amount in half. The sweetness of the apples and the spices made up the difference. You can also try a sugar substitute or sugar blend if you like the taste and use it in other recipes. 3. After the apples have slow-cooked for 10 hours, stir in vanilla and break up the apple slices with a spoon. Re-cover and cook for 2 hours more. 4. Allow the mixture to cool and then puree it with an immersion blender (or in batches in a food processor) for a nice smooth finish. It’s okay to leave some chunks if that’s how you roll. 5. 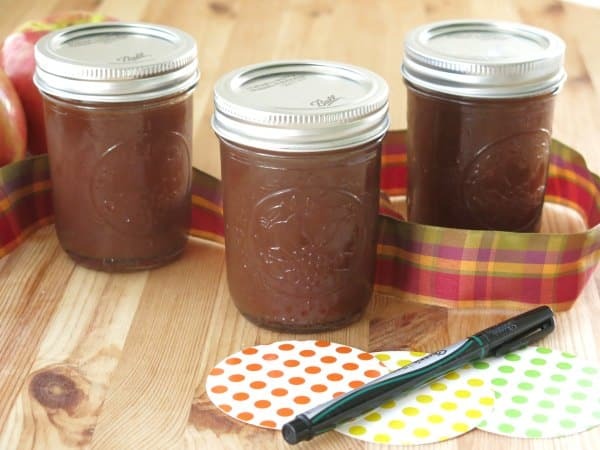 Spoon the crock pot apple butter into air tight containers. Decorate with ribbons and tags if you are giving some away as gifts. Otherwise, use within 2 weeks or store in the freezer for up to two months. It’s makes about 8 cups. So, there will be plenty to share! 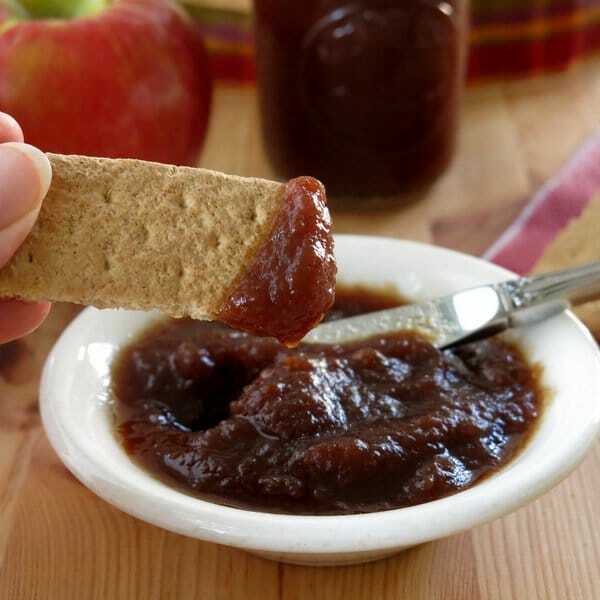 Crock-pot apple butter is easy to make and allows control over the amount of added sugar. It's a lovely gift and this recipe makes plenty! Core, peel and slice apples and place in a crock pot. Mix together sugar, cinnamon, nutmeg and salt. Toss apple slices with with sugar mixture. Stir in vanilla extract and crush large apple pieces with a spoon. Cook on low for 2 more hours. Transfer to air tight containers and store in refrigerator for up to two weeks or store in the freezer for up to 2 months. I love how creative you are with your crockpot! Great idea. Thanks Betsy! It’s one of my favorite kitchen gadgets! Does this recipe use any water or cider while cooking the apples? This recipe does not use any water or cider. Thanks for you comment! How long do you boil the water after you fill the jars and are in the sealing process? The batch so far smells incredible! Hi! Since I froze the jars, I did not go through the canning process. Check with a site like the Kitchn or AllRecipes for information on canning. I hope you enjoy it! Jars need to be under boiling water for 10 minutes you will hear the seal pop after you take them out to check if the seal is good just press down on the center of the lid and if it pops back up store in your fridge or freezer. I used 8 oz jars and they all sealed fine. You can always make another batch sugar-free, and then mix them together. That way you end up with just the right sweetness, and with a lot of apple butter (that’s a good problem to have). Can you used honey instead of brown sugar would it makes a difference in the sweetness. Also how much honey would you use instead of 1 cup of brown sugar. My husband is diabetic so would I want to use tart apples also instead of all sweet apples. He hasn’t been a diabetic long so just learning about how to cook for him. 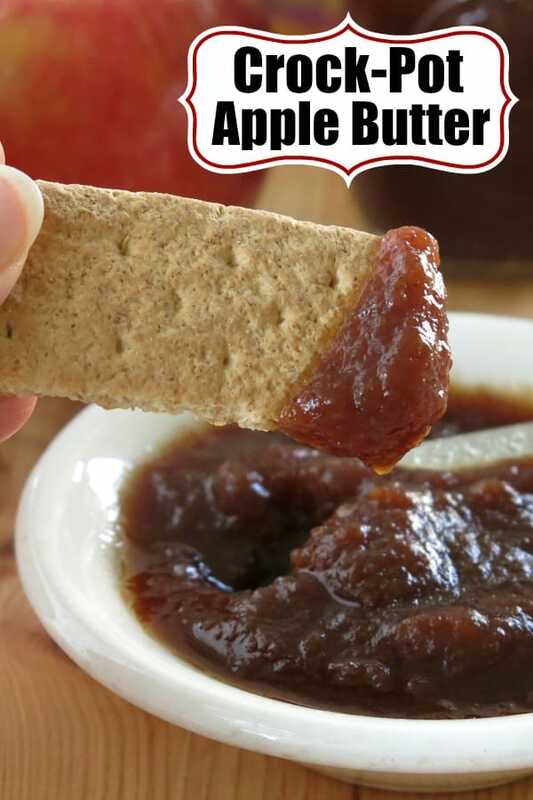 He loves apple butter so this would be a nice treat. Thanks for the recipe. I am curious how this recipe can be labeled low in sugar when it has a cup of brown sugar in it? I am not diabetic but very disappointed in the labeling of this recipe. I don’t like when people post things that are deceiving. Unfortunately I will not be making this recipe…..I found something else that only has water and a few spices in it. Thanks for your feedback and sharing the tip on spices…they do wonders in a recipe. I’m sorry you felt deceived. I try to always be as honest as possible in all of my posts and in titling. In this one, I discussed adjusting the level of sugar and alternatives that I use to traditional sugar. And, this recipe does use much less sugar than many traditional recipes. Can stevia be substituted for the sugar? Absolutely. I often use a Sugar/Stevia combination. How many cups of apples would you recommend? What happens if you mix in vanilla extract in with the spices at first on accident ? Hi! I hope it still worked out! Hi! I’m in the process of making this incredible smelling recipe. I’m at the part where I have just added the vanilla and it is cooking for the additional time. It seems kinda runny yet. Is it because it is so warm? Is there any thing I need to do to thicken it? Also, I don’t have an immersion blender but do have a standard one. Will this work? 6 pounds of apples before or after peeling and coring? Thanks so much for the recipe! I’m making it right now as I write this. Easy recipe, and I like that it’s less sugar then most other recipes. Never made apple butter before so I’m looking forward to it! Hi! I hope you enjoyed it! Thanks for this I live in Virginia Beach as well. My canning turned out great a couple a couple years ago. Everyone loved this recipe. I am glad I kept it. Just made this with the stevia sugar blend you recommend and it was OUTSTANDING! Thank you! I made the recipe and loved it and so did my 10 year old! Making a 2nd batch now. How many cups of apples peeled, cored would you use for this recipe…is it like jam? It sounds good…. Hi! We used pounds for the recipe because the number of apples will vary depending upon the size. We used 6 pounds of apples. It is very much the consistency of jam. Thanks for your comment! Made sugat less honey crisp apple butter it is a little funny what can I do? Hi! What seems to be the problem. I’m happy to help you trouble shoot. Did you mean “runny”? If so, you can take the lid off the slow cooker and turn it on high for two hours, stirring occasionally. If I cut recipe in half, do I cut the cooking time also? Hi! You can cut the cook time back by 2-3 hours. Note that initially you will have applesauce and then the mixture will get thicker and thicker. You can stop at any time. It tends to thicken a little in the refrigerator. Also, removing the lid during the last hour helps excess moisture to evaporate. I hope that helps! This recipe is delicious! Made it last night with a combo of 3 apples (York, Stayman & Golden Delicious – right from the orchard) & added 1/8 tsp ground cloves. 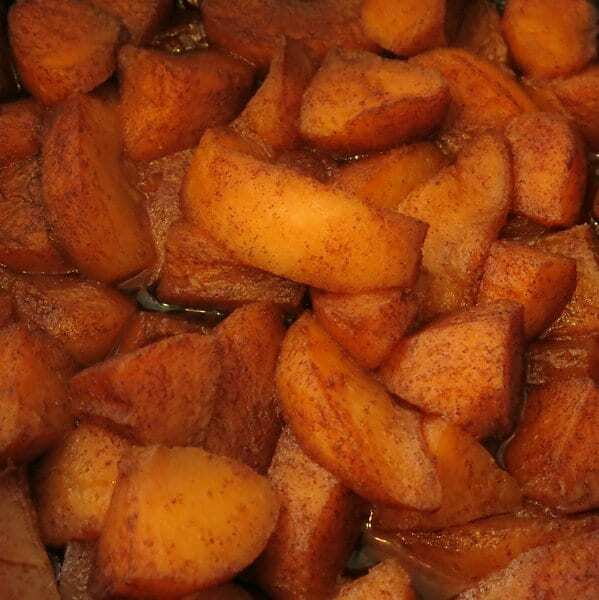 Smells wonderful – will definitely make again & will try it with different apples. Thanks for the recipe! I’m so glad you enjoyed it! Love the mix of apples you used! Thanks so much for your comment! I loooove the idea of adding in some pumpkin! Do you pack the brown sugar..
Hi! You do not need to pack it! It will result in more sugar if you do.